Dar es Salaam — Acacia contributed $712 million (Sh1.61 trillion) to the national economy last year, a recent independent report released by Ernst and Young (E&Y) has said. The report, titled 'Acacia Mining plc Total Economic and Tax Contributions in Tanzania, 2017', concludes that during the year Acacia's businesses purchased $434 million (Sh984 billion) of goods and services from suppliers located in Tanzania, 67 per cent of total spend on goods and services in 2017. Of this amount, approximately $120 million (Sh271 billion) of goods and services were purchased from businesses in the direct locality of the three mines in the country's Lake Zone. Despite facing several challenges during the year, in 2017 Acacia contributed $712 million (Sh1.61 trillion) to the national economy, which represents around 1.5 per cent of Tanzania's total gross domestic product (GDP), says E&Y report. This compares with a total contribution of $724 million (Sh1.64 trillion) the previous year. The 2017 contribution is comprised of $200 million (Sh453 billion) by the businesses, an indirect contribution via suppliers of $304 million (Sh689 billion) and induced contributions of $208 million (Sh471 billion). 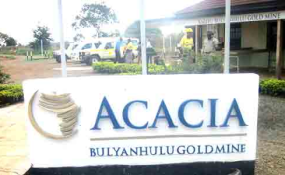 The report shows that the Acacia's three mines made a total tax contribution to the Tanzanian Treasury of $186 million (Sh421 billion), comprising $101 million (Sh229 billion) by the company, $42 million (Sh95 billion) by its employees, and a further $42 million (Sh95 billion) in indirect or induced taxes. "This report further reiterates our commitment to continue conducting our business in a way that benefits the country and host communities in which we operate," Asa Mwaipopo, managing director, Tanzania, said. "It is encouraging to see that our contribution stretches from our zone of influence to a national level as we continue to support efforts towards Tanzania's socio-economic growth and the attainment of the country's Development Vision 2025."